One of Jane Goodall’s pioneering discoveries was that chimpanzees have personalities and emotions. Although this was controversial at first, today scientists accept this method. 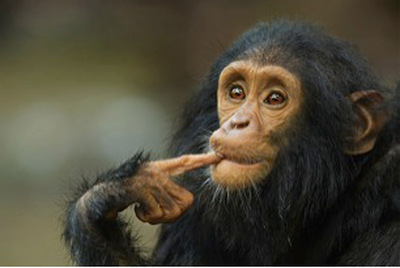 The researchers continue to name the members of the Gombe chimpanzee community and write about their character traits. We have compiled profiles of a few of Gombe’s chimpanzees from the F and G families, from Jane’s years in Tanzania and today. David Greybeard was the first chimpanzee to accept Jane and allow her to study him. 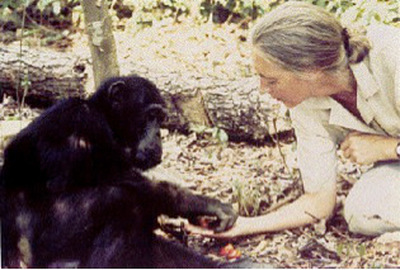 Jane would often leave bananas and nuts for him outside her tent, which initiated David (and other chimpanzees) stealing food and other items from her campsite. By building this relationship, Jane was able to observe him using leaves to scoop termites out of their hole. This was an example of chimpanzee tool use that the world had never seen. Gradually, as the other chimpanzees observed Jane with David, they came to accept her too. Jane has described David as calm and gentle, but also with an air of dignity. In an interview, she once demonstrated David’s pout when he was determined about something. Although he was an important male in the chimpanzee community, his gentle demeanor kept him from ever becoming an alpha male. When David died in 1968, Jane commented that she mourned for him more than she had for any other chimpanzee. Golden and Glitter, twins to mother Gremlin, were born in 1998. 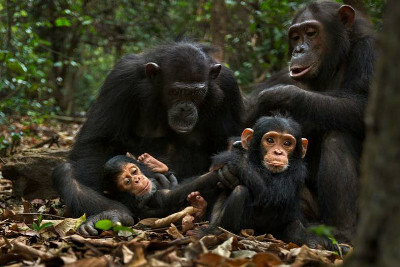 For a mother chimpanzee to breed surviving twins in the wild is very rare, so the girls have been the subjects of observation for much of their lives. From the beginning, it was clear that the two were inseparatable. While Golden was larger and more outgoing, Glitter eventually developed more confidence. Gremlin raised the twins with the help of their older sister Gaia, who developed a more dependent relationship with Glitter. Even as the twins grew and became more comfortable leaving the group for short periods of time, they always traveled together. Researchers have observed the twins often losing sight of each other for a short period of time, and quickly becoming distressed until they find one another. They also exhibited their gentle nature in one instance where they came into contact with a redtailed monkey, a primate that chimpanzees don’t usually get along with. Instead, the twins coexisted with the redtail for quite some time before wandering off. Today, Golden and Glitter both have their own children, named Glamour and Gossamer, respectively. Gizmo is the younger sibling of Golden and Glitter, and was born in 2009. As an infant, he was very playful and attention-seeking. When his sister Glitter had a baby, his mother Gremlin started to pay more attention to the baby than to Gizmo. Gizmo ended up forming a strong relationship with Glitter instead. Although Gizmo is not large enough to be an alpha male, he has an assertive side, once throwing a rock at a researcher for coming too close to his family. Flirt was born in 1998, the granddaughter of Flo, who was one of the chimps Jane encountered during the early years at Gombe. Her family has a high-ranking legacy, with her mother, father, and some of her brothers and sisters becoming prominent members of the chimpanzee community. This may explain her rough, playful attitude when she was young. 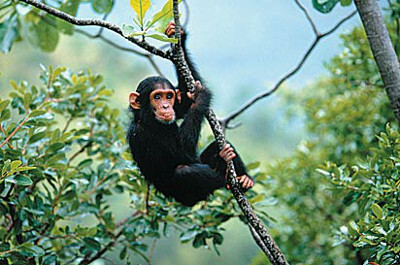 One researcher recorded often seeing Flirt standing on her mother’s back, rather than hanging as most infant chimps did. Despite Flirt’s promise as a high-ranking female in the Kasekela community, she eventually transitioned independently to the Mitumba community, where she is now a low-ranking, peripheral female. One researcher has been documenting Flirt’s transition process, and has reported losing Flirt for months at a time. True to her independent spirit, Flirt often strays from the community for long stretches of time before returning. Luckily, when she does return, she has no problem socializing with the other females, and even spends time with Edgar, an alpha male.